The U.S. Federal Reserve finally backed off from hiking short term interest rates in the U.S., choosing to keep the target range of 2.25%-2.50% for the Federal Funds Rate. 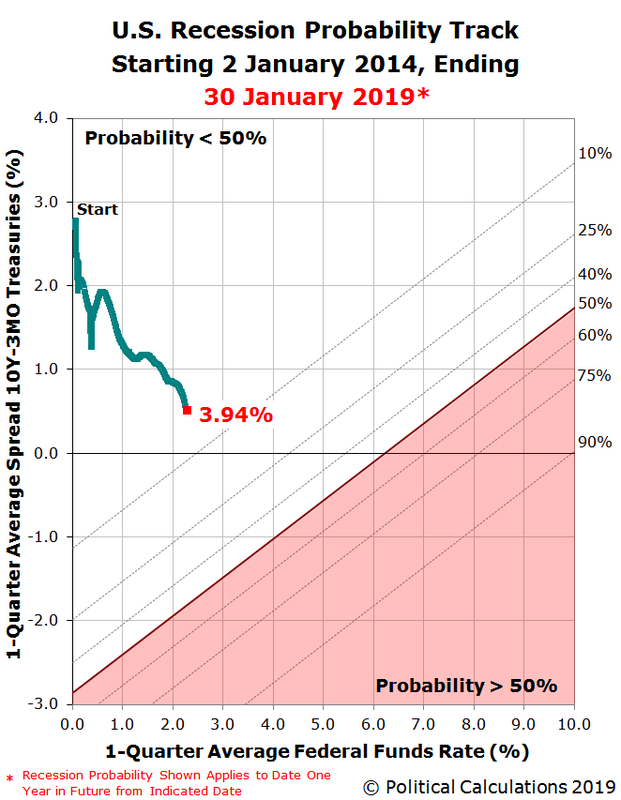 The risk that the U.S. economy will enter into a national recession at some time in the next twelve months now stands at 3.9%, which is up by roughly one-and-a-half percentage points since our last snapshot of the U.S. recession probability from late December 2018. The current 3.9% probability works out to be nearly a 1-in-25 chance that a recession will eventually be found by the National Bureau of Economic Research to have begun at some point between 30 January 2019 and 30 January 2020, according to a model developed by Jonathan Wright of the Federal Reserve Board back in 2006. The Fed's decision to hold the Federal Funds Rate steady comes as the bond market has been responding to deteriorating conditions in the global economy, particularly in China and in the Eurozone. The U.S. Treasury yield curve, as measured by the spread between the 10-Year and 3-Month constant maturity U.S. Treasuries, has been flattening in response to those global conditions as bond investors would appear to pursue a flight to relative quality investing strategy. The Recession Probability Track shows where these two factors have set the probability of a recession starting in the U.S. during the next 12 months. We anticipate that the probability of recession will continue to rise in 2019, with the Fed bowing to reality and putting its previously planned series of quarter-point rate hikes on hold. The Fed has also indicated that it is weighing an early end to its plans to shrink its balance sheet, where their decision to do so will remove the additional pressure it has been generating toward flattening the yield curve through quantitative tightening. The questions now are whether they put the brakes on fast enough to avoid having the U.S. economy fall into recession and whether the recession forecasting model we're using is accurately reflecting the nation's risk of recession.